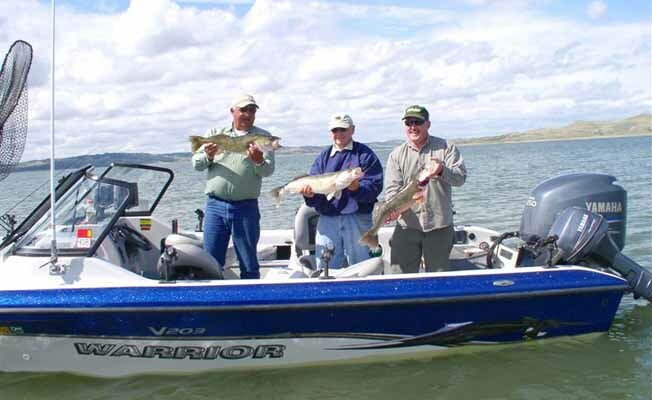 Welcome to Fort Peck Lake in Eastern Montana fishing for Walleye, Sauger, Northern Pike, Smallmouth Bass. Late May - July are the favored months to catch these species. Suspended Lake Trout can be caught trolling deep diving crank baits in the early spring. While Fort Peck does have Chinook Salmon, we haven't experience a good run on them for several years. While reservations help plan our season, we do take spur of the moment trips. If you are close and would like to join us give us a call anytime. All you need to bring when you fish with us is lunch, license (warm water stamp too), and beverages. We recommend bringing your camera. We will share our photos; putting them on a cd for you. We provide gas, boat, guide, tackle, rods & reels. We'll fillet your catch and freeze your trophy's for transport to the taxidermist of your choice. We recommend Missouri Breaks Taxidermy in Jordan. Lodging arrangements can be made at Hell Creek Marina (406-557-2345), Hell Creek State Park. Jordan, MT is 25 miles from our launch area on a gravel road. Garfield Motel (406-557-6215) and Fellman's Motel & convenience store (406-557-2209), Hill Top Cafe and Ryan's Grocery will help make your stay comfortable if you choose to stay in Jordan. The Hell Creek State Park at Hell Creek is available for camping and RV's. They have electric hook-ups as well as coin operated showers and RV dumping facilities. Beginning this year you must make reservations. Myron, J.C Taylor and I have Warrior boats, Vern Gagnon has a Yarcraft, Brian Albrecht has a Crestliner and Jim Muzynoski has a Lund. They are 19' - 20' boats and serve three fishing clients comfortably for walleye, northern pike and smallmouth bass. Because of the downriggers required to fish for salmon and lake trout, we can only serve two people per boat when fishing for those species. Two boats and guides are necessary to effectively fish a party of four. Our rates are $400.00 per boat per day and accommodate one - three fishermen. If you have any questions please feel welcome to call anytime! Also, visit our website: www.KiblerCharterFishing.com. Email us at: kibler@midrivers.com. Please join us on Facebook as updates happen there first. Meet us at Hell Creek Bay on Fort Peck Lake, 25 miles north of Jordan, Montana.Meet us at Hell Creek Bay on Fort Peck Lake, 25 miles north of Jordan, Montana.